Parvovirus B19, also known as Fifth Disease, causes a mild rash illness mostly associated in children, but adults can get it, too. Illness usually begins about 4 to 14 days after getting infected. The first symptoms are fever, runny nose, and headache. 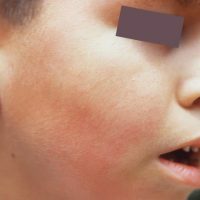 After that, a red rash on the face, also known as “slapped cheek rash”, can develop. This is the telltale sign of Fifth Disease. A rash may also develop on the chest, back, buttocks, arms, and legs. The itchy rash usually lasts 7 to 10 days and appear lacy once it begins to go away. A common symptom among adults is painful and swollen joints. The pain usually lasts 1 to 3 weeks, but can last for months. Once it goes away no long-term problems arise. People with weakened immune systems caused by leukemia, cancer, organ transplants, or HIV are at risk for chronic anemia if infected with parvovirus B19. Parvovirus is transmitted through respiratory secretions from an infected person’s coughs or sneezes, through an infected person’s blood or blood products, or through vertical transmission from a pregnant woman to her baby. Because there is no vaccine, the best way to protect yourself and others from developing Fifth Disease is by washing your hands with soap and water, covering your mouth and nose when sneezing and coughing, avoiding touching your eyes, nose, and mouth, avoiding close contact with those infected, and staying home from work or school when sick. There is no specific treatment for Fifth Disease; only treatment in relieving symptoms is available. 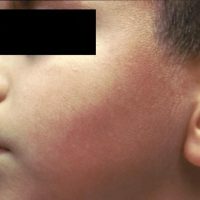 Fifth Disease is known for its “slapped cheek” rash that develops in children mostly several days after a fever, runny nose, and headache. The rash varies in intensity and can last from 7 to 10 days. In adults infected with parvovirus B19, joint swelling and pain may develop and last for about 1 to 3 weeks. Although, sometimes the joint pain and swelling may last for months. It usually subsides without long-term issues. For people at risk of high complications (those with weakened immune systems due to cancer, organ transplants, or HIV infection) could develop chronic anemia. Because pregnant women who have become infected with parvovirus are able to spread the virus to their baby, there is less than 5% chance of an infected baby to develop severe anemia and cause the woman to miscarriage. Therefore, when a pregnant woman is infected, she should let her provider know so she can be monitored. 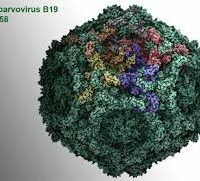 Parvovirus B19 is primarily spread through respiratory secretions from when an infected person coughs or sneezes. People are most contagious at the period of illness when it appears as the common cold. After a rash or joint pain develops, people are not as contagious. Parvovirus B19 can also be spread through blood contact and from a pregnant woman to her infant. 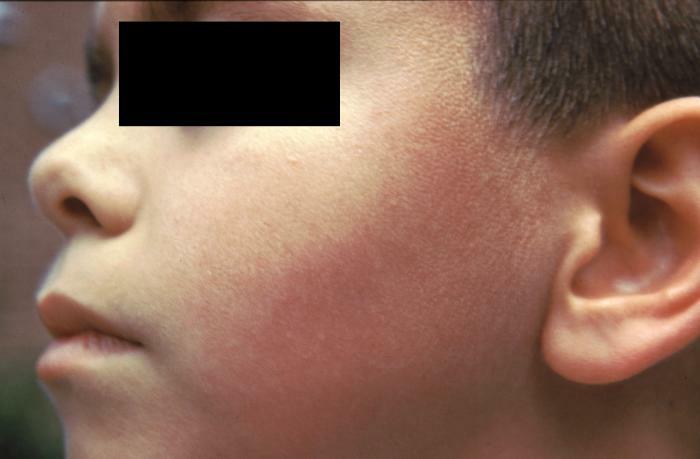 Diagnosis of fifth disease is usually made by the healthcare provider once seeing the “slapped cheek” rash. Blood tests can also be performed to determine whether someone is infected with parvovirus B19. 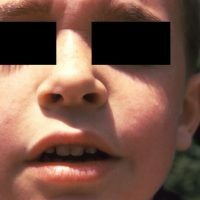 Fifth disease subsides on its own. The only treatment available for fifth disease is treatment of the symptoms. 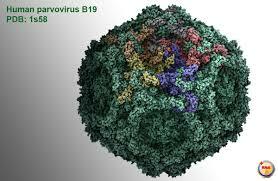 Once someone is infected with parvovirus B19, they develop lifelong immunity to the virus. A blood test can be performed to determine whether someone has immunity or is infected with the virus. There is no routine surveillance conducted on parvovirus B19 in Hawaii. Anyone can become infected with parvovirus B19 if they have not been infected or exposed before. There is no vaccine available for parvovirus B19. The best way to prevent any respiratory infection is to avoid close contact with sick individuals, proper hand hygiene, and avoid touching your face (especially mouth, nose, and eyes). The best way a sick individual can prevent further spread is to stay home from school or work, cover their nose and mouth when sneezing and coughing, and proper hand hygiene. Because parvovirus B19 can also be spread through blood and blood products, any contact with bodily fluids of an infected person should be avoided. Pregnant women who have been recently exposed to parvovirus B19 should talk with their providers about testing for immunity or infection and monitoring the infection with additional prenatal visits, blood tests, and ultrasounds because there is less than 5% chance of the infected baby developing severe anemia and the woman may miscarry. 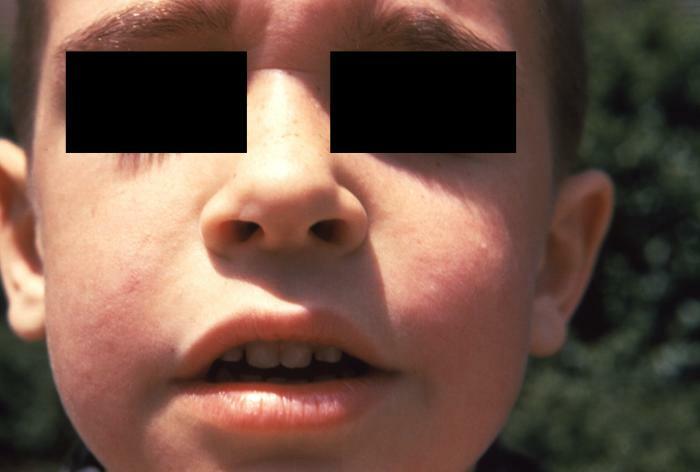 Parvovirus B19 causes fifth disease. 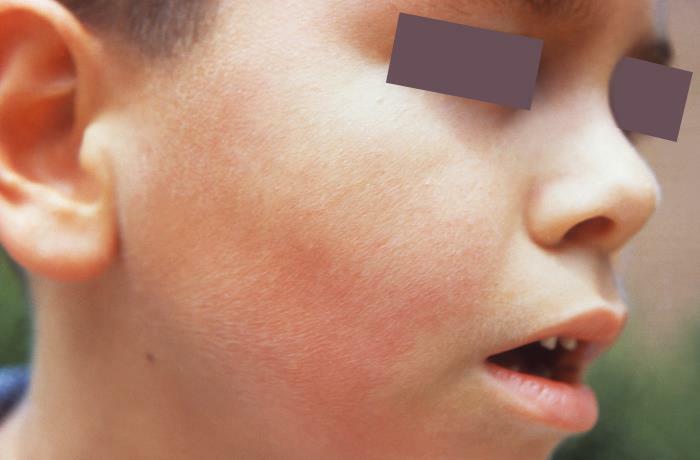 Symptoms for children can include fever, runny nose, headache, and “slapped cheek” rash. Adults are more likely to develop swollen and painful joints than the rash. People who are immunocompromised dude to cancer, HIV infection, sickle cell anemia, and organ transplants are at high risk for developing chronic anemia. It is especially important to monitor pregnant women who have become exposed or infected with parvovirus B19 because there is less than a 5% chance of them miscarrying. IgM and IgG can be performed to determine whether an infection is recent or whether a person has lifelong immunity, which is important in the case of pregnant women becoming exposed. Treatment is only available to relieve symptoms. Fifth disease will subside on its own.